Our representative will greet you on your arrival at Chandigarh Airport, railway station, or any other preferred location of your choice and drive you straight out to Dharmashala. You will check in to the hotel and can spend the rest of the day indulging in leisure activities. If you have the energy, step out in the evening for a stroll to the market before you hit the sack at night. 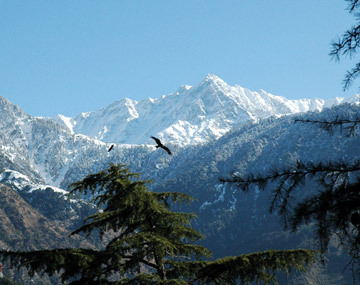 Day two is reserved for Dharamshala sightseeing tour. So be sure to have a filling breakfast. Soon after you lick your plates clean, you will be escorted on a guided tour to the famous home of the Dalai Lama - The Dalai Lama Temple, and the Bhagsu Nag temple. This is not all. Wet your feet at the picturesque Bhagsu Waterfall and enjoy the mesmerizing sunset at Naddi Sunset Point. You will also be taken to the beautiful Dal Lake and the ancient St. John Church before you head back to your hotel for the night. The day begins with a visit to one of the most famous international cricket stadiums in the world. You will also be taken to the War Memorial and Kangra Art Museum, which has the most stunning exhibits ever. Next in line is the Buddhist Institute of Norbulingka and tour of the many ancient Hindu temples in the city before you retire for the night to your hotel. Soon, after breakfast you will need to checkout from the hotel and will be driven back to Chandigarh. You can choose your preferred drop point where your tour will end. “Once a year, go somewhere you have never been.” This beautiful quote by none other than Dalai Lama himself, stirs the feeling of wanderlust within us. Head out to the home of Dalai Lama and nurture your spiritual instinct is one of the most famous tourist places in India – Dharmashala. The sheer beauty of this place will sweep you off your feet. Mesmerizing mountains, gushing waterfalls, snow and sleet, is in abundance in this beautiful land of the Lamas. There is more to a Dharmashala tour package just than monasteries and temples; you can also explore the adventurer in you by setting out on long treks on the lush green mountains. Planning a trip can be more tedious than you imagine. Why go about worrying yourself in planning a trip to Dharmashala, when you can pick from the best of dharamshala tourism packages. We offer the most well planned Dharmashala holiday packages at rather affordable rates. We leave no stone unturned in planning the best holiday for you and your family. We will take care of the small details right from greeting you at the airport, to taking you on a sightseeing tour of the city to arranging your accommodation and meals. And, all that you need to do is relax and enjoy yourself. Personal expenses incurred such as laundry, telephones calls made from the hotel, snacks and drinks bought on the trip or any tips given to drivers, porters, and hotel staff.